Xanthelasma palpebrarum is presented as a yellow plaque on the eyelids. Xanthelasma lesions are composed of fat cells that accumulate in the dermis and subcutaneous layer; progressive accumulation involves the orbicularis oculi muscle. Most patients with this condition request to have the lesion removed for cosmetic reasons, for which various treatment options are available, including surgical excision, chemical peeling, cryotherapy, argon laser, carbon dioxide (CO2) laser, and neodymium:yttrium aluminum garnet (Nd:YAG) laser. Nevertheless, xanthelasmas are difficult to remove completely and has a high chance of recurrence. Recently, we were able to completely remove xanthelasma palpebrarum lesions in nine patients using erbium (Er):YAG laser. The Er:YAG laser seemed to maximize ablation effects, allowing us to easily determine whether the lesion had been completely removed. Moreover, we noted that, due to minor residual thermal damage, wound healing occurred rapidly with minimum side effects. Xanthelasma palpebrarum is a yellowish benign tumor that occurs on the eyelid. Lesions begin to develop at the medial part of the upper eyelid and grows, in some cases extending to the lower eyelid.1,2 Patients generally do not complain of pain or discomfort, but may request removal for cosmetic reasons. Xanthelasma palpebrarum is the most common form of xanthoma. Xanthelasma palpebrarum is composed of xanthoma or foam cells, both of which contain fat. These cells exhibit accumulation of histiocytes and can include cholesterol.3 Xanthelasma palpebrarum lesions first appear in the reticular dermis or subcutaneous tissue and gradually increase in thickness. Lesions can then spread to not only the subcutaneous layer, but also the orbicularis oculi muscle. Various treatment options for xanthelasma palpebrarum are available, including surgical excision,4,5 chemical peeling,6,7 cryotherapy, argon laser,8 carbon dioxide (CO2) laser,9,10 and neodymium:yttrium aluminum garnet (Nd:YAG) laser.11,12 However, the results thereof are generally suboptimal and involve high recurrence rates. Recently, a 2,940-nm erbium (Er):YAG laser has come into use for treating xanthelasma palpebrarum.13–16 The Er:YAG laser seems to eliminate xanthelasma palpebrarum more precisely than other techniques. Additionally, treatment with the laser enables wound healing with no residual scarring. Herein, we report on our use of an Er:YAG laser to treat xanthelasma palpebrarum and the results thereof in nine patients. We analyzed nine patients (six females and three males; ages ranging from 42 to 50 years) who were treated with a 2,940-nm Er:YAG laser for xanthelasma palpebrarum. Diagnosis of xanthelasma palpebrarum was made according to distinctive clinical features thereof. 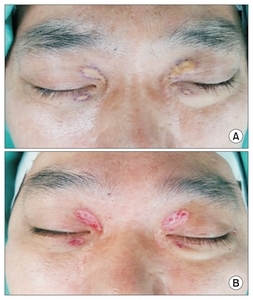 At baseline, eight patients exhibited xanthelasma palpebrarum lesions on both eyelids; only one patient presented with unilateral xanthelasma palpebrarum. Seven patients had xanthelasmas only on the upper eyelid, while two patients showed lesions on both the upper and lower eyelids. The xanthelasmas appeared to have progressed differently in each patient: Three patients had lesions in the lower dermis and subcutaneous layer, five had full-thickness lesions, and one patient exhibited extension to the orbicularis oculi muscle. All patients had xanthelasmas on the medial upper eyelid; these were present for 6 months to 4 years before the patients came in for treatment. In one patient with a lesion for 4 years, the xanthelasma progressed from the upper eyelid to the medial canthal area and lower eyelid. The widths of the lesions varied from 4 mm to 12 mm. No patient had systemic disease, and only two had an increased blood cholesterol level. No patients had a family history of xanthelasma. The removal procedure was as follows. Anesthetic ophthalmic solution was applied, and a stainless metal eye shield was inserted to protect the cornea. The lesions were demarcated with a surgical marking pen (Fig. 1A), and anesthesia was administered with lidocaine hydrochloride at 2% and epinephrine at 1:100,000. Then, five to 20 passes were made with the 2,940-nm Er:YAG laser (Contour; Sciton, Palo Alto, CA, USA) at a 2-mm spot size in the 50–100 mJ ablation mode until the lesion was fully vaporized. As the Er:YAG laser beam is most effective on hydrophilic tissue, it was possible to both maximize vaporization and determine whether the xanthelasma was fully removed. The procedure was performed with a loupe to aid in recognition of removal. Bleeding during the procedure was stopped by switching the Er:YAG laser to the coagulation mode (Fig. 1B): if bleeding is severe, electro-coagulation can be performed; however, in most cases, moist gauze compression is adequate. After completely removing xanthelasma lesions with the laser, we applied a thin occlusive hydrocolloid dressing (DuoDERM CGF; ConvaTec, ER Squibb & Sons, Princeton, NJ, USA) until wound healing was completed. Small xanthelasma lesion required 5 to 14 days for complete epithelialization (Fig. 2–4). No patient experienced recurrence on follow-up for 6 to 30 months, and erythema disappeared within 1 to 2 weeks. We recorded no hypertrophic scarring and no hyper- or hypopigmentation. After removal of the lesions with the laser, patients could fully close their eyes without ectropion; no contraction or lagophthalmos was observed. Xanthelasmas do not resolve spontaneously. Over time, they gain color and become thicker and larger. Xanthelasmas start in the reticular dermis or subdermis and progress to the subcutaneous layer and orbicularis oculi muscle. Various treatment options are available including excision,4,5 trichloroacetic acid (TCA) peeling,6,7 cryotherapy, argon laser,8 CO2 laser,9,10 and Nd:YAG laser therapy.11,12 Small lesions can be effectively treated by surgical excision.5 If the lesion is large, however, direct closure can be difficult and contracture, ectropion, and eyelid deformities can develop. Because these usually occur in middle-aged individuals with redundant skin, eyelid contractures do not occur often. However, upper blepharoplasty may be needed for a drooping eyelid.4 If a defect is large after removal of a xanthelasma, a skin graft is occasionally performed. However, this is not recommended on the upper eyelid, because grafted skin on a mobile tissue can wrinkle easily.17,18 Peeling with 25–30% TCA is also used in some cases to unroof the skin. However, the depth of treatment is difficult to control with this method, making complete removal impossible. Moreover, serious complications, such as hypertrophic scar formation, contracture, and ectropion, can occur. A shallow chemical peel will not completely remove the lesion, which can recur, leading to multiple procedures. Cryotherapy is also used, but introduces problems similar to those with chemical peeling. We believe that the Er:YAG laser provides the most effective treatment for xanthelasmas, because it completely removes eyelid xanthelasmas with a minimal recurrence rate and it is easy to administer. Common skin lesions on the eyelids of middle-aged women include syringomas and milia. These multiple small lesions occur in association with sweat and fat glands, and can also be removed with a laser. The Er:YAG laser can remove these small lesions with a small spot size and in the ablation mode. If a middle age person has minor wrinkles around the eyes, one can apply a combination of coagulation and ablation modes to remove skin lesions and wrinkles. This will improve skin elasticity and facilitate eyelid rejuvenation. Fig. 1. 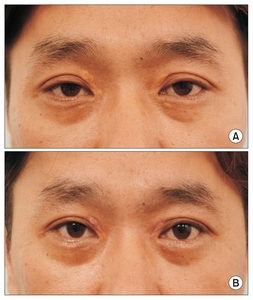 A 42-year-old male (A) before and (B) immediately after laser removal of xanthelasmas on the upper and lower eyelids. Erbium:yttrium aluminum garnet (Er:YAG) laser generated little thermal damage and maximized vaporization, enabling easy recognition of degrees of removal. Fig. 2. Same treatment as that for the patient in . (A) Before treatment and (B) 2 weeks after treatment. Fig. 3. 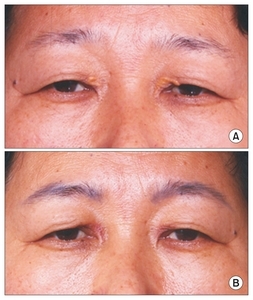 A 60-year-old female patient (A) before and (B) 1 month after treatment of xanthelasmas on the upper eyelids. Parkes, ML, and Waller, TS (1984). Xanthelasma palpebrarum. Laryngoscope. 94, 1238-40. Rohrich, RJ, Janis, JE, and Pownell, PH (2002). Xanthelasma palpebrarum: a review and current management principles. Plast Reconstr Surg. 110, 1310-4. Bergman, R (1994). The pathogenesis and clinical significance of xanthelasma palpebrarum. J Am Acad Dermatol. 30, 236-42. Lee, HY, Jin, US, Minn, KW, and Park, YO (2013). Outcomes of surgical management of xanthelasma palpebrarum. Arch Plast Surg. 40, 380-6. Mendelson, BC, and Masson, JK (1976). Xanthelasma: follow-up on results after surgical excision. Plast Reconstr Surg. 58, 535-8. Cannon, PS, Ajit, R, and Leatherbarrow, B (2010). Efficacy of trichloroacetic acid (95%) in the management of xanthelasma palpebrarum. Clin Exp Dermatol. 35, 845-8. Mourad, B, Elgarhy, LH, Ellakkawy, HA, and Elmahdy, N (2015). Assessment of efficacy and tolerability of different concentrations of trichloroacetic acid vs. carbon dioxide laser in treatment of xanthelasma palpebrarum. J Cosmet Dermatol. 14, 209-15. Hintschich, C (1995). Argon laser coagulation of xanthelasmas. Ophthalmologe. 92, 858-61. Raulin, C, Schoenermark, MP, Werner, S, and Greve, B (1999). Xanthelasma palpebrarum: treatment with the ultrapulsed CO2 laser. Lasers Surg Med. 24, 122-7. Ahn, KJ, Kang, JS, and Cho, SB (2013). Treatment of xanthelasma palpebrarum by the pinhole method using a 10,600-nm carbon dioxide laser. Med Laser. 2, 70-2. Fusade, T (2008). Treatment of xanthelasma palpebrarum by 1064-nm Q-switched Nd:YAG laser: a study of 11 cases. Br J Dermatol. 158, 84-7. Karsai, S, Schmitt, L, and Raulin, C (2009). Is Q-switched neodymium-doped yttrium aluminium garnet laser an effective approach to treat xanthelasma palpebrarum? Results from a clinical study of 76 cases. Dermatol Surg. 35, 1962-9. Borelli, C, and Kaudewitz, P (2001). Xanthelasma palpebrarum: treatment with the erbium:YAG laser. Lasers Surg Med. 29, 260-4. Lieb, WE, Klink, T, and Münnich, S (2000). Ophthalmologe. 97, 835-41. Mannino, G, Papale, A, De Bella, F, Mollo, R, Morgia, P, and Gabrieli, CB (2001). Use of Erbium:YAG laser in the treatment of palpebral xanthelasmas. Ophthalmic Surg Lasers. 32, 129-33. Balevi, A, Ustuner, P, and Ozdemir, M (2017). Erbium:yttrium aluminum garnet laser versus Q-switched neodymium:yttrium aluminum garnet laser for the treatment of xanthelasma palpebrarum. J Cosmet Laser Ther. 19, 100-5. Yang, Y, Sun, J, Xiong, L, and Li, Q (2013). 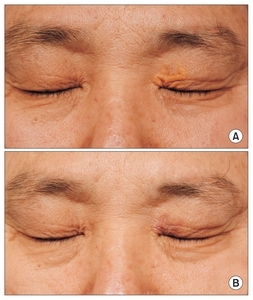 Treatment of xanthelasma palpebrarum by upper eyelid skin flap incorporating blepharoplasty. Aesthetic Plast Surg. 37, 882-6. Kose, R (2013). Treatment of large xanthelasma palpebrarums with full-thickness skin grafts obtained by blepharoplasty. J Cutan Med Surg. 17, 197-200.